Stargate productions centre on the premise of a Stargate, a ring-shaped alien device that creates a wormhole enabling personal transportation to complementary devices located cosmic distances away. Under the control of the United States government, the Stargate is kept a secret from the public. This allows for story-lines to present no contradiction between depicted events and reality, an effect compounded by setting Stargate in the present day, and depicting Earth accurately, with any unrealistic technology originating solely from alien civilizations. These extraterrestrial civilizations are typically more pre-industrial than scientifically advanced, and are almost always human. Together, this allows for stories predominated by human interaction in Earth-like environments, an unusual feature for a science fiction franchise focused on exploration of other worlds. In the Stargate franchise this is explained as being the result of alien interference in Earth's distant past - the concept influenced by the theories of Erich von Däniken. Many ancient mythologies are shown to be the result of aliens who had visited Earth posing as gods by using their technology to give the impression of deific power. While some of these aliens had benign intentions, a race known as the Goa'uld used Stargates to move humans from Ancient Egypt to many other habitable planets as slaves and worshippers, simultaneously being responsible for the Egyptian religion and culture. 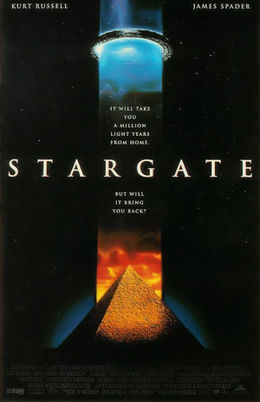 Following a successful rebellion, the Goa'uld fled Earth, and the Stargate was buried and forgotten until modern times, when the United States acquired it following an archaeological dig. With the rediscovery of the function of the Stargate, the galaxy becomes a source of knowledge, as well as threats, and the attention of the Goa'uld is drawn once more to Earth. For questions that encompass the entire franchise or multiple series, use of the stargate tag will cover them. Why does no one ever come through Earth's Stargate?